Euan Blair, Digital Marketing Director, tells us what brands can do when their bad press ranks on page one of Google search results. Brands have tried to manage how the media portrays them since the advent of newspapers. But how has reputation management changed in a digital world? A negative front-page headline used to appear for a day or two until the natural news cycle would move the story further into the paper and then into obscurity. As they say – it would become tomorrow’s fish and chip paper. It was less common for the negative stories to seriously damage a brand, destroy share prices and even topple a business. The internet and the popularity of search engines, where information is indexed and archived for all to see, means you can no longer rely on the story to pass. A negative story or damming review of your product/service can appear on the front page of Google when users search for your brand name. The good news is there are things you can do to limit the damage – but why does it happen in the first place? 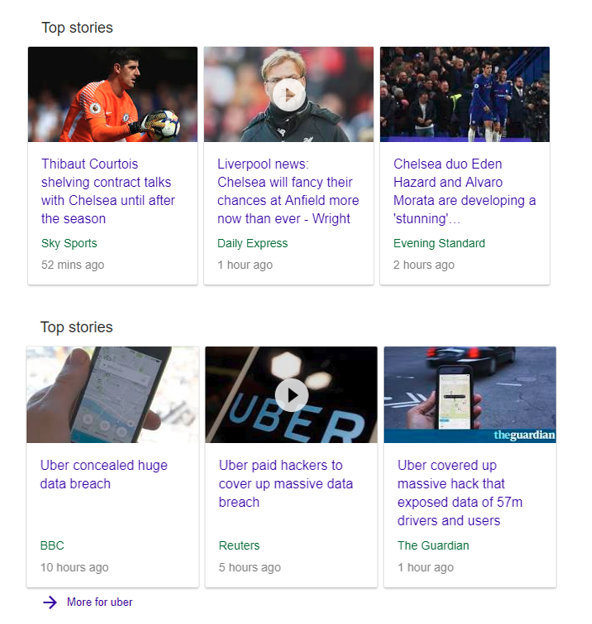 Why does Google show negative stories for a brand search? Google aims to deliver the best results to its users to keep market share. They use an algorithm to determine where to rank a website for a given search query. The best sign of QDF at work is when Google shows its “Top Stories” results. A query that is both frequently searched for and subject to change will trigger a specific layout in the search results that supports this feature. Note the time stamps on those results; Google only presents current news in this area. These stories are continually refreshed with the most relevant and up-to-date stories, meaning each story – positive or negative – will usually stop appearing after a day or two. This is why you find negative stories appearing outside the “Top Stories” results, and those are the stories that are tough to budge. Google aims to give a mixed and balanced result when a user makes a brand query. Articles appearing on authoritative and trusted websites, like the BBC or Guardian, make perfect fodder for front page results – and therein lies the rub. Every situation and company is different, so the below is presented as a framework rather than a list of hard and fast rules of how to deal with negative listings on Google. Acknowledge the problem and get in front of it. Forget for a moment that something negative is appearing in an online format. It’s not a technical problem. It’s not a search engine optimisation problem. What you have is a reputation problem. PR and marketing teams are great at changing the public’s perception of a brand. However, until you address the core issue that resulted in the problem, you are papering over the cracks. Investigate the issue. What caused it? How was it dealt with? What are the repercussions of the problem being in the public domain? What can be learned from the issue? And, most importantly, how can the issue and those like it be avoided in future? If you’re wondering how to get in front of something that may not have happened, it’s all in contingency planning. Have a communications plan to deal with negative issues and proactively monitor your brand’s results on Google. Any marketing team, in-house or agency side should be doing this on an on-going basis. Ensure yours are. Can you get the negative story or listing removed from the internet? If the negative story is on a site or platform you control (such as Facebook, Twitter, Yelp) you can explore options to remove it but consider if responding to the issue is more effective than simply removing it. You don’t want a backlash occurring because you removed a complaint. Again, having a plan and process is critical. Google has provided a tool to remove listings that a brand does not like if they meet certain criteria – results they class as “irrelevant, outdated or otherwise inappropriate”. If you think you can meet these criteria and progress with this option, remember this will not remove the article from the internet, just from search results: it can still be linked to and shared. Reach out to websites and journalists for a follow-up to the negative story. If it is a newspaper result that is causing you issue, you can use relationships with journalists to help improve matters. A good PR team will already have these relationships, through years of experience. Explore options for a follow-up piece or interview where you can put your side of the story across or discuss what has been done about it. Change that negative into a positive. This needs to be balanced against the potential for increased negative feedback and remember that you won’t have 100% control over the final story. Push negative stories down by using other brand properties. You can use Google’s love of authoritative websites to help “push down” negative stories. If you don’t already have them, build up profiles on Facebook, Twitter, LinkedIn, and other existing platforms. These are powerful and authoritative websites in the eyes of search engines. Your profile on them can start to rank for brand queries and displace negative stories further down the first page or onto page two. You do need to keep these channels updated. This requires a strategy and on-going commitment and resources. A major benefit of engaging in social platforms such as these is that it allows you direct communication with your customers. Also, consider using Google’s PPC AdWords platform to push down results by creating a campaign for your brand name. Google tends to rank PPC ads above regular listings, so it pushes them down. The downside is that you will pay for traffic you were already getting. Brand terms tend to be low cost so it can be cost effective technique to deal with negative listings and you can always switch it off when you are happy with the organic results. Proactively push good stories related to your brand. Those negative stories appearing on news sites for your brand terms are not ranking because they are inherently negative. They are ranking because the story contains your brand name. Pushing positive stories to media outlets gives you an opportunity to change the conversation and perception around your brand. A PR team should be doing this for you anyway in reaction to a negative story. Ensure the name of your business is used in the article title to give it the best chance of ranking for a query related to your business. When you get a positive story published, link to from your site. Push it out through your social channels to help give it a further boost. Acknowledge your business is more visible than ever. I’m reiterating previous points here, but stories stay around longer than ever before. No legitimate business sets out to give a negative experience to its customers, but the decisions your company makes and possible repercussions should be considered through the lens of reputation management. Proactively monitor your brand reputation, have plans in place to react to negative situations and know how you’ll deal with complaints, issues, and reviews. You can’t keep 100 percent of people happy 100 percent of the time. The internet has brought added complexity regarding reputation management, but it’s also given us the tools to engage with customers like never before. Your brand should have a plan in place to reduce the impact on your brand of negative results on page one of Google, before they even exist. Proactively monitor your brand online. Claim your social profiles. Create a strategy to populate these and get them onto the first page of Google. Work to maintain positive relationships with your key media influencers. If you’ve seen negative listings appear on Google for your brand and would like to discuss how to minimise the impact it has on your business, get in contact today.